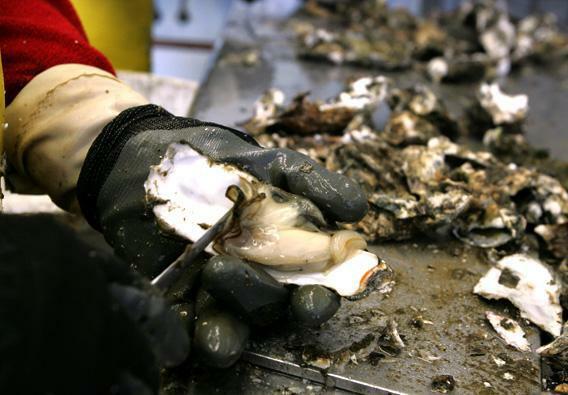 Ocean acidification and oysters: Shellfish are already suffering. Don’t believe in climate change? Talk to a clam digger. A worker shucks a fresh oyster at the Drakes Bay Oyster Co. in June 2007 in Point Reyes Station, Calif. Behind the counter at Seattle’s Taylor Shellfish Market, a brawny guy with a goatee pries open kumamoto, virginica, and shigoku oysters as easily as other men pop beer cans. David Leck is a national oyster shucking champion who opened and plated a dozen of them in just over a minute (time is added for broken shells or mangled meat) at the 2012 Boston International Oyster Shucking Competition. You have to be quick, these days, to keep up with demand. The oysters here were grown nearby in Taylor’s hundred-year-old beds, but the current hunger for pedigreed mollusks on the half shell stretches to raw bars and markets across the country. A similar oyster craze swept the United States in the 1800s, when the bivalves were eaten with alacrity in New York, San Francisco, and anywhere else that could get them fresh. Development of a fancy new technology, canning, meant there was money in preserved oysters, too. Gold miners in Northern California celebrated their riches with an oyster omelet called hangtown fry. New Yorkers ate them on the street; late at night they ate them in “oyster cellars.” Walt Whitman had them for breakfast. That wave crashed. By the early 1900s, oysters were disappearing because of overharvesting and water pollution. Today’s revival is possible because oyster farms are better managed, and regulations have improved water quality. But a modern threat looms for ice-chilled fruits de mer platters, although it’s hard to tell with oyster juice on your chin. This time it’s a worldwide problem, affecting marine ecosystems everywhere. Ocean waters are turning corrosive, and it’s happening so quickly scientists say there may not be any oysters left to eat in coming decades. Ocean acidification, as scientists call this pickling of the seas, is, like climate change, a result of the enormous amount of carbon dioxide humans have pumped into the atmosphere. Oceans have absorbed about a quarter of that output, and ocean chemistry has changed as a result. Surface water pH has long been an alkaline 8.2, not far from the pH of baking soda, but it now averages about 8.1. That doesn’t look like much, but since pH is a logarithmic scale, that means a 30 percent increase in the acidity. By the end of this century, surface water pH could further lower to 7.8 or below. We don’t yet know who the ocean’s winners and losers will be in the more corrosive world. Jellyfish and some seagrasses may thrive under more acidic conditions. On the other hand, calcifiers—organisms that make calcium carbonate shells and skeletons, such as shellfish and corals—appear to be in trouble. In the United States, scientists have seen dissolving clam larvae in Maine, corroded oysters in Washington state’s hatcheries, and mussels with thinned shells off the Pacific Northwest coast. Taylor Shellfish first saw what this pH shift could do to its business in 2006, when the company noticed that two- and three-day-old oyster larvae in its hatcheries were dying. In itself, this wasn’t news. “Hatcheries have a lot of different variables,” says Bill Dewey, Taylor’s spokesperson. “There are a host of reasons your larvae can die.” But this time, none of the usual fixes—filtering out harmful bacteria, for instance—made a difference. By 2009, hatchery production was down 60 to 80 percent, and others in the region were reporting similar problems. Oyster larvae outside of hatcheries were dying, too. In Willapa Bay, an estuary off the southwest Washington coast where a quarter of the nation’s oysters are harvested, many growers rely on natural sets—free-spawning larvae that swim around until they attach themselves to oyster shells placed by growers. Those natural sets stopped producing, and the Willapa growers turned to the struggling hatcheries for oyster seed. Monitoring is not a permanent fix, however, so scientists are exploring adaptation strategies. At NOAA’s Northwest Fisheries Center, research ecologist Shallin Busch and colleagues are studying the possibility of raising oysters in eelgrass beds, since the plants naturally take up carbon and bury it in sediment, perhaps making their immediate environment less acidic. In Maine, Mark Green of St. Joseph’s College is looking for ways to restore clam populations by raising alkalinity in shellfish beds using crushed shells. “It’s like putting a layer of Rolaids down,” he says. Other possibilities being studied include lowering pH by adding sodium carbonate to hatchery water. Selective breeding may lead to oysters that survive better in these new conditions. Nitrogen runoff from land also contributes to acidification, so reducing water pollution can boost shellfish survival. Unlike other problems caused by CO2, ocean acidification is spurring some action, possibly because the effects are so visibly tied to the cause. “With climate change there’s often a schism between scientists and those who flat out don’t want to believe it,” says Green. “It’s hard to get a man to believe something if his job depends on not believing it.” But in this case, he says, it’s the people in the industry who are leading awareness. “Talk to shellfish clammers—the guys who dig—and every one of them is on board, especially the old timers. They have seen over the years the populations go from incredibly productive to virtually disappearing in many cases.” One bit of anecdotal evidence diggers have reported is clams with thinner shells—so thin, they say, that sometimes it’s not possible to fill bushel baskets to the top because the fragile shells at the bottom will be crushed. For the diggers, a scientific fix is the only hope they have of saving their industry. But even the best near-shore solution can’t stop the pH drop that’s taking place oceanwide, not unless we plan to stop releasing carbon dioxide into the atmosphere and replace it with Milk of Magnesia. Last fall, some of the first evidence of how ocean acidification is affecting organisms in the wild came from scientists investigating Southern Ocean pteropods, tiny marine snails also known as sea butterflies. NOAA’s Nina Bednarsek, lead author of the report, says the team found dissolving shells in pteropods at far shallower depths than expected. The spiraling shells were pitted and peeling like paint on a neglected house. “It was fascinating and a bit disturbing to see,” she says. The dissolution won’t necessarily kill pteropods, “but they will definitely be more vulnerable to predators and infectious diseases.” Pteropods are an abundant, important part of the ocean food web, preying on the ocean’s phytoplankton—drifting plants—and providing food for larger species. Pteropods make up 50 percent of the diet of pink salmon in the North Pacific. According to NOAA chemical oceanographer Richard Feely, a 10 percent drop in the production of pteropods produces a 20 percent weight drop in a mature pink salmon. Sea butterflies are an indicator species, showing that ocean acidification is already affecting marine ecosystems. The corrosive surface water scientists are measuring is in effect a time capsule from the 1960s. Carbon dioxide is absorbed by phytoplankton on the water’s surface. When those organisms die, they sink deep into the ocean, taking the CO2 along for the ride. At depth, the dead phytoplankton release the CO2 back into the water. For this and other reasons, the deeper ocean tends more toward acidity than shallow waters. In places where we are seeing the effects of ocean acidification first, such as the northwestern United States and the parts of the Southern Ocean studied by Bednarsek, that old, corrosive water has risen to the surface. As the years pass, that upwelling water will have a lower and lower pH, reflecting the increase in our carbon dioxide output from the 1980s, the 1990s, and today. By midcentury, it’s likely that about 50 percent of the seawater will be too corrosive for growing oysters. As with climate change, ocean acidification will require more comprehensive, aggressive measures. But, hey, if we don’t fix this? We’ll need to invent some new recipes for jellyfish and seagrass.